Natalie Tomasco, Resource Management, retired on June 18, after 26 years of service to Falvey Memorial Library and Villanova University. When Natalie came to Villanova in June, 1984, she had no library experience, but that didn’t stop her from quickly mastering the complex world of periodicals. 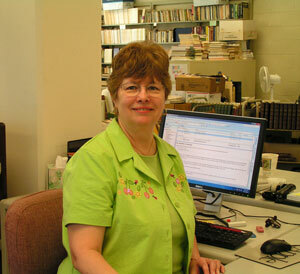 Initially, Natalie’s main responsibility was to check-in the daily mail, which consisted of hundreds of current print issues for the library’s journal collection. She did this manually in an old-fashioned Kardex (a metal cabinet consisting of small drawers filled with paper cards) that dated back quite a few years. As Falvey moved to a new integrated library system, Natalie successfully converted this tedious manual check-in process to an automated one, and the old Kardex was relegated to the attic. When the electronic revolution hit journals in the 1990’s, Natalie easily made the adjustment, helping to convert our large print periodical collection to online access. Her attention to detail and organizational skills were essential in this complicated process, as subscriptions and binding decisions had to be made and followed through for both print and microfilm titles, records had to be updated, and online access confirmed. By the time Natalie retired, the vast majority of our journal collection was online. Maintaining this electronic collection took a tremendous amount of time and effort, as journals moved from one publisher to another, were merged into databases and packages, and shifted from one platform to another. Natalie discovered that dealing with electronic journals was considerably more difficult than dealing with print, but she welcomed the challenges and became quite proficient with their management. Natalie also served on the library’s Publications and Communication team. Her attention to detail made her an excellent editor, and she also wrote feature articles and took photographs. One particular photograph of the Augustinian Cemetery, featured in the Compass article, “The Spanish Flu, Villanova College and Philadelphia,” captured the attention of Dorothy A. Pettit and Janice Bailie, who asked permission to reprint it in their book, A Cruel Wind: Pandemic Flu in America, 1918-1920. Natalie will be spending her time volunteering at her local library, doing yoga on her back deck and making yearly trips to Disney World to visit Mickey and Minnie Mouse.